Welcome back for Day 11, if you are just arriving for the first time all the details and the linkup can found HERE. and a £15 eGift certificate.for the Uniko Studio online store! Comment if you like to add sparkle and shine to your tags? ...for your chance to win. So many more new ideas for tags. Thanks so much Uniko and Tracey. Elegant tags today! I do like to add sparkle and shine to my tags. Do I like to add sparkle and shine..? Thanks for the inspiration tags. So many trio's today. I'm definitely all about the sparkle! Love these sweet tags! You have to have sparkle and shine on your tags! Every tag is so fantastic ... great event. A little sparkle and shine adds just that extra. More gorgeous stamps today ! Love seeing them each day, thanks! Fabulous inspiration from Uniko. Their stamps and projects are so gorgeous. pretty cute tags.. I love that little santa image.. thanks for sharing.. I love to heat emboss so I guess the answer is "yes I like sparkle and shine." Having said that I am not big on glitter, but Wink of Stella is just right. I like sparkle on everything! Love how some are colored and others are left plain. 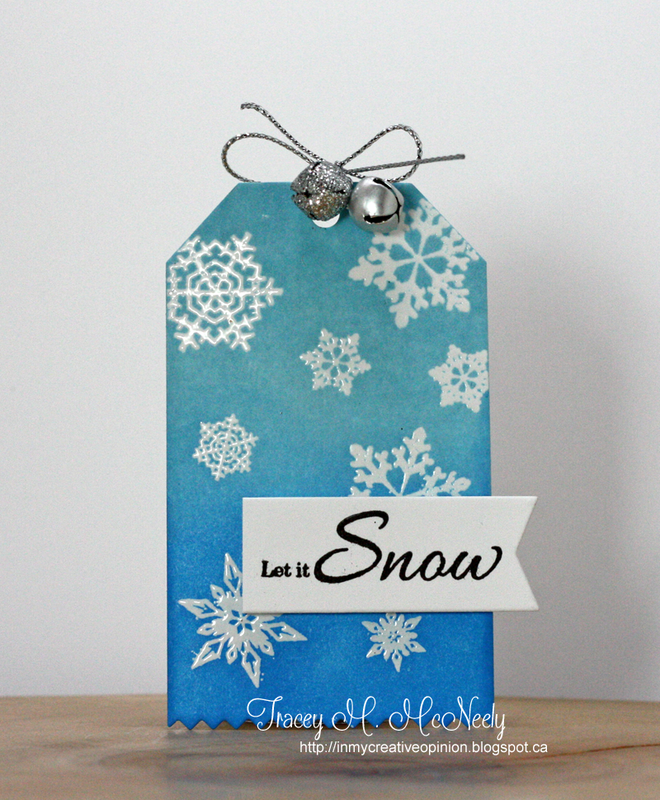 Gorgeous tag Tracey and I love the sheen on those snowflakes. I like to add some sparkle to my tags - what is life without a little bling? Wow!The tags today are really gorgeous! I love to add some shine to my tags! Awesome tags! There's quite an assortment of wonderful tags. Another great day of ideas. I like a little sparkle -- I have a white EP with glitter in it that is perfect for snow, snowflakes, snowmen, etc. Amazing and elegant tags! I like to add sparkle and shine to my tags. Beautiful tags today! I love your ombre background and your wonderful snowflakes. I love to add sparkle and shine, but sometimes I forget! These are beautiful (love your ink resist snowflake tag! ), and yes, I do love adding sparkle and shine to my tags! Cute little tear drop Santa! Do I like sparkle and shine? Um YES!! Such lovely tags!! Oh yes! Sparkle is a must...lol!! Elegant tags!! Love them all!! I love to add sparkle and shine to my tags and cards! Beautiful CAS inspired cards! I love the pretty inking and th great colors in all of these lovely Uniko designs! Your tag is beautiful Tracey! I love the Distressed background! So pretty. Gorgeous tags! Thank you so much for all the inspiration. I can't wait to start making some tags of my own. And I love sparkle and shine! Pretty tags! I do not add sparkle and shine, typically, to my tags. I don't know why not but I don't. Maybe that should change?! Love all the tags and love to put some sparkle on my cards. Lots of cuteness & yours is beautiful, Tracey! I love shine & sparkle on everything!! 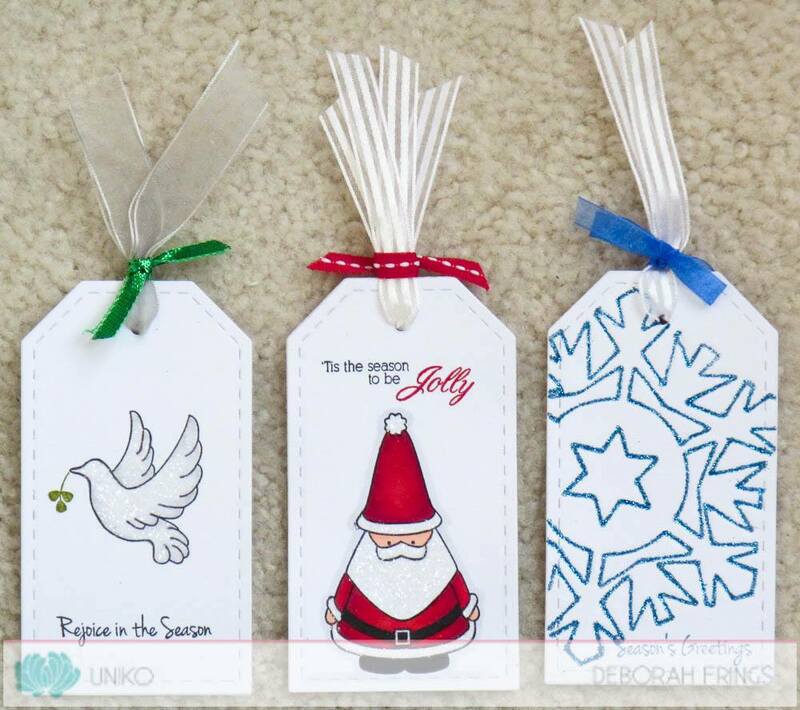 Beautiful Uniko tags! Love these stamps! More wonderful inspiration - I want my mojo back! I had a look at your Pinterest board and it's a sea of tag inspiration! As for sparkle and shine on my tags, that would be a big YES! Terrific tags from the Uniko DT!! LOVE the color blending on yours Tracey, so pretty!! I DO like to add sparkle to my tags. It makes them just a bit more festive! 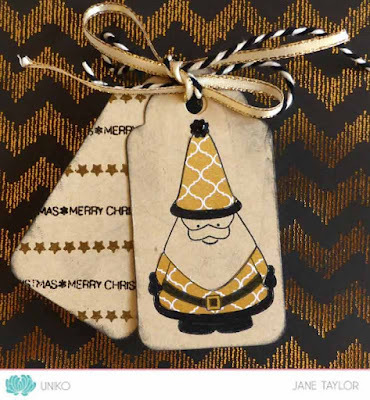 Your wonderful tag illustrates how effective a little sparkle is--love it! I have been using clear Irresistibles and really like how it goes on. Thanks for the introduction to Uniko - I hadn't heard of them before. Sparkle and shine is always fun but I don't use them every time. Another set of super gorgeous tags!!! I say bring on the sparkle AND shine! 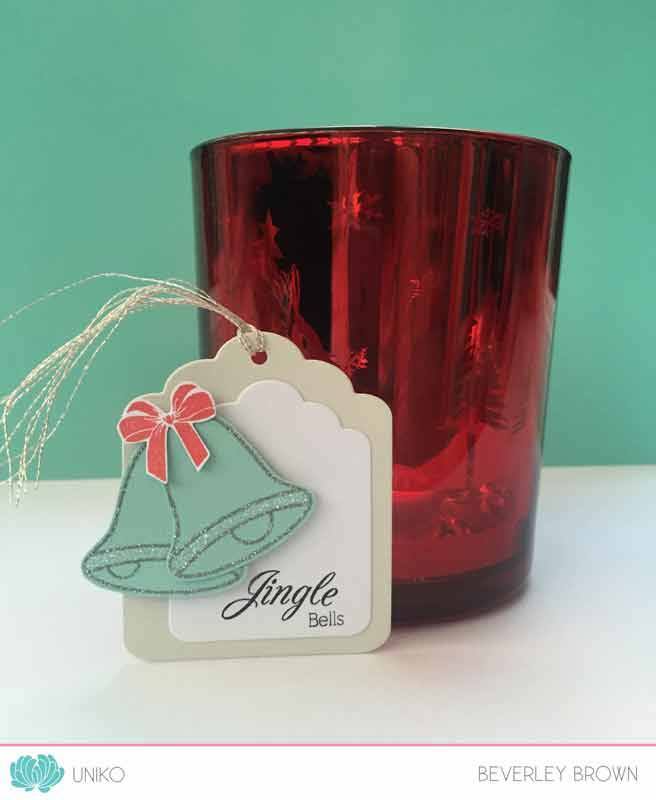 The Wink of Stella Clear Brush Tip pens are the perfect way to add a little festive magic to limited acreage. 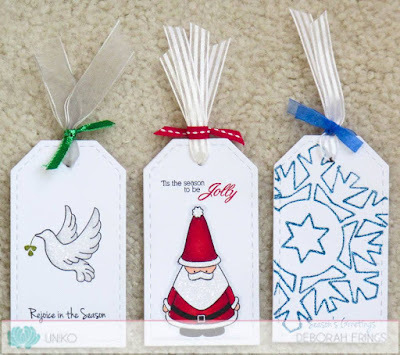 CUTE and BEAUTIFUL tags today - LOVE the shapes and designs!!! LOVE your snowflakes and ink blending ... BOTH techniques I really need to work on!!! 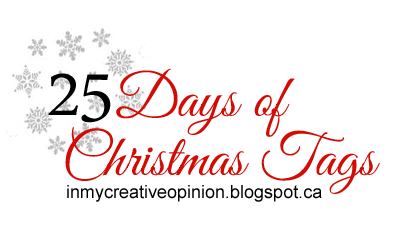 Such cute images and fabulous tags today!! WOS adds so much fun to a project! I love sparkle and shine on EVERYTHING! I am enjoying your hop so much. So many cute and beautiful creations. Lots of ideas. Thanks so much for getting this together. My glitter pen is certainly one of my most handy tools! So I guess yes. Sparkle!!! Great tags, I don't have any of their stamps, but love 'em. Great ideas for the tags today. I love a little sparkle on the tags if i can put it in. Oh my goodness would I love to get my hands on some Uniko!!! Gorgeous tags, ladies!!! 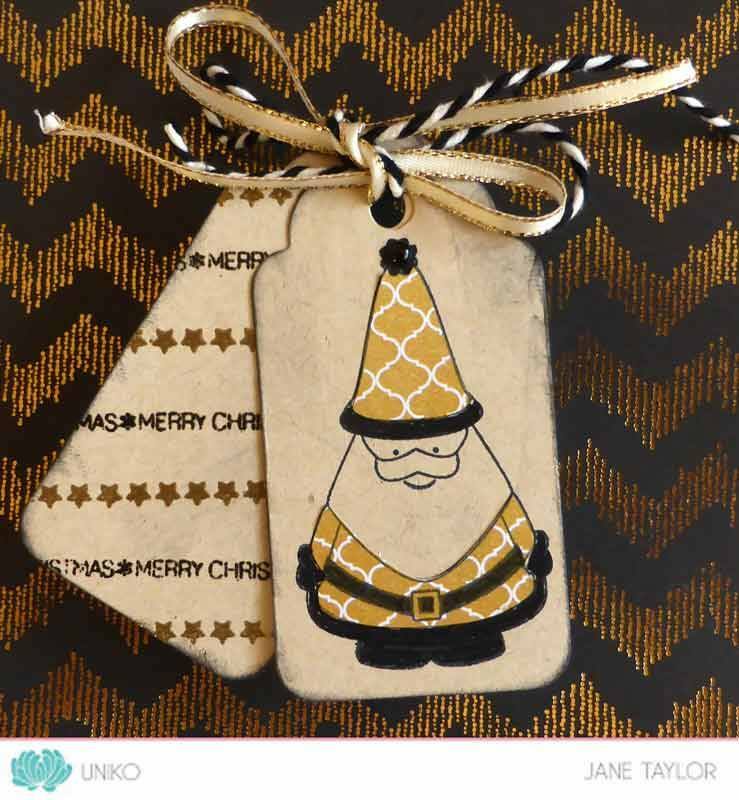 Glossy accents add a beautiful dimension to any tag, or card! Yes, I do like to add shine to my tags and cards. The tags today seem a bit more simple, less elaborate with less layers and embellishments. They look more like "my" tags! I was encouraged to see this because I thought maybe I was doing something wrong! Love the CAS look. My projects definitely have to have sparkle and shine! Love these tags! A subtle touch with sparkle and shine is usually perfect for me! 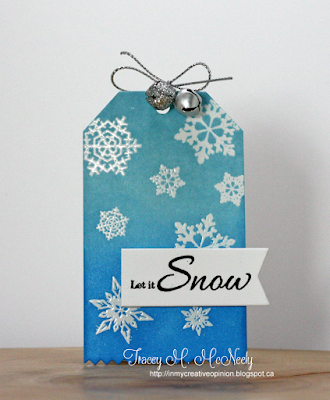 Another gorgeous tag, Tracey! 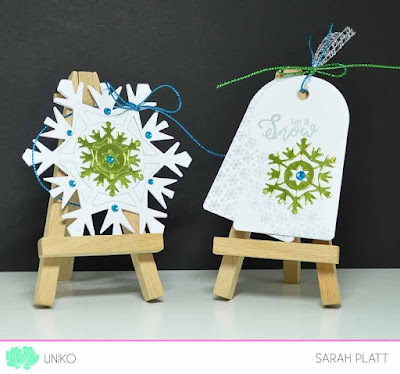 I love how you blended your inks and your snowflakes are so pretty! I love adding sparkle and shine to my tags! Sooo Pretty!! I like to add Sparkle to EVERYTHING!!! Yes, I do like sparkle and shine, but I'm happy with kraft and holly as well. I love to add sparkles and shine in lots of ways with glitter, sequins, perfect pearls and oh when I found glittery embossing powder I was doing a happy dance. Such pretty tag projects today! I love glitter but hate to clean it up! Love these classy tags, so pretty and elegant. 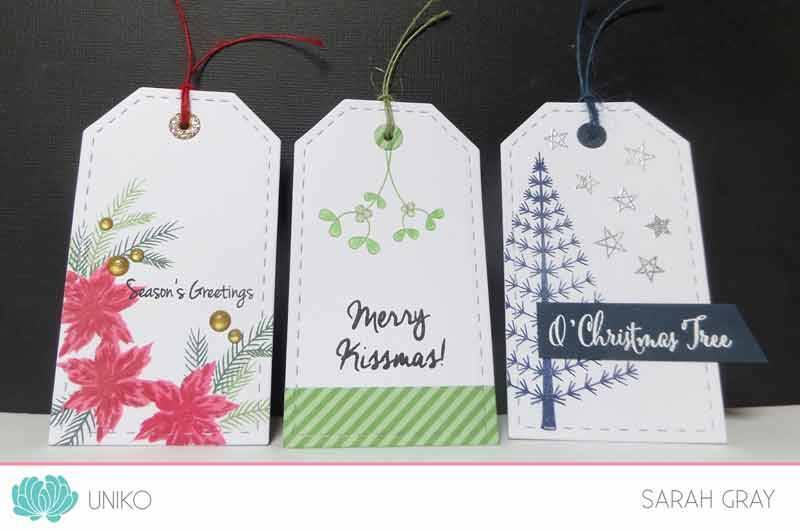 I love adding sparkle to all my holiday cards and tags! Such sweet tags Tracey and ladies. Love the pretty embellishments you all used. 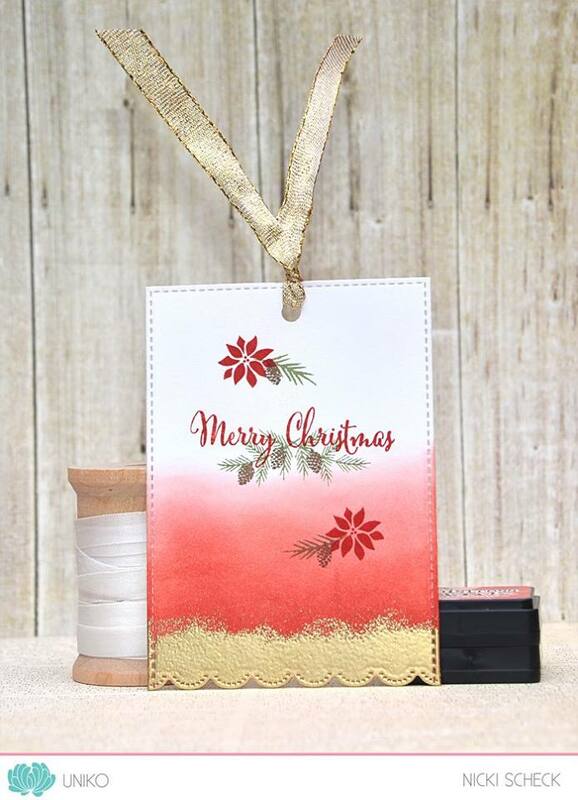 I do love sparkle and shine... glitter paper is one of my favorites these days with dies... I also love rhinestones and pearls... easy get my hands on from local stores and inexpensive. 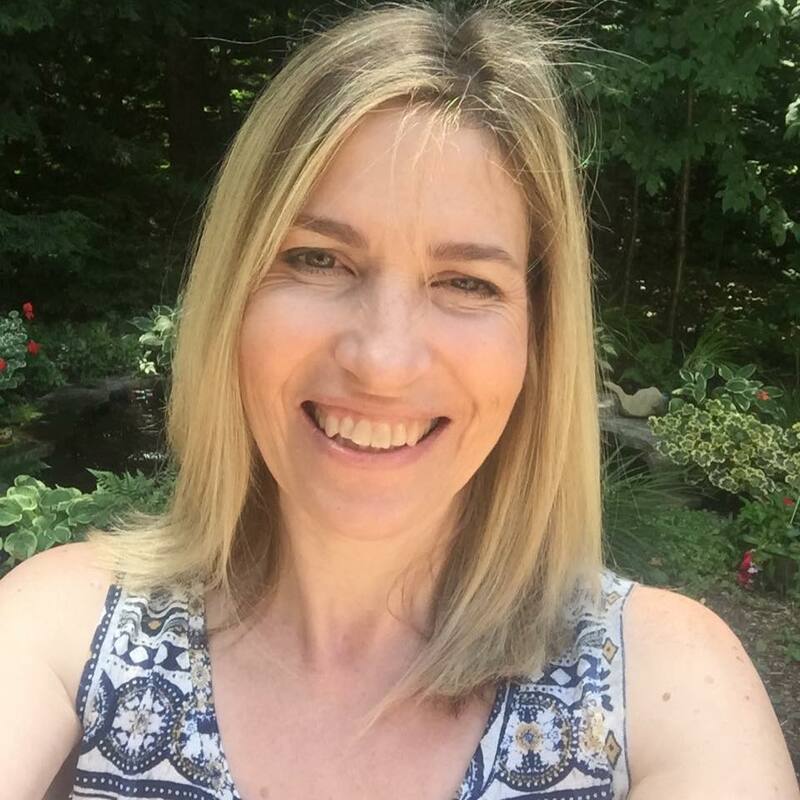 Simply graceful creations and love the unique ideas, very inspirational creations! Yes, i love sparkle in my creations! 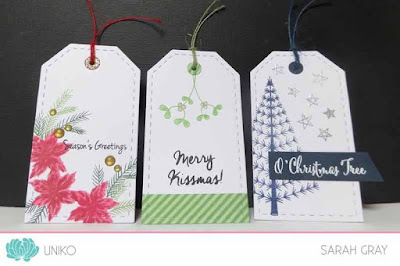 Who doesn't like to add a little sparkle and shine to their tags - it's festive right? Lots of sparkle & shine! Lovely tags by the Uniko Team, I have some of these stamps, and love those. Your snowflake is so pretty! A little added Sparkle and shine is always perfect for the holidays! Some really pretty tags, I love those snowflakes! Haven't used sparkle and shine to my tags as of yet but that might be about to change. I'm not familiar with this stamp company. Thanks for the intro! Love that gradient, inked background on your sweet tag! I love sparkle on my tags! Love these tags, so beautiful. I also love to add sparkle and shine to my projects as well. I love sparkle and shine on my Christmas cards, so obviously I would like it on my tags too. Thanks for the inspiration! A hint of sparkle and shine is nice.